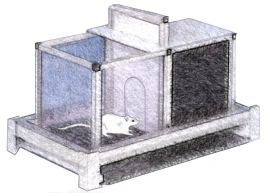 In the Passive (Inhibitory) Avoidance test the subjects learn to avoid a mild aversive stimulus by remaining in the lighted side of a two-compartment chamber and not entering the dark (unsafe) side. Technicians record the median step-through latency (i.e., number of seconds elapsed before subjects cross into the unsafe side of the chamber), as well as the percentage of animals from each test group that crosses the threshold within the time allowed (i.e., 300 sec). This test is a quick, simple method of assessing the effects of age, genetic models, or drugs on memory retention.